On June 8, William “Bill” Gitt, former faculty member and chief engineer at Berklee, passed away at age 86. Born in Hanover, Pennsylvania, Bill got his start at Dartmouth College in the early 1950s, as a student building electronics for the college’s radio station. He joined the U.S. Army after college, where he expanded his knowledge of electronics. Bill contracted at RCA for the army on the first silicone-based computer in Camden, New Jersey. While working as a projectionist at the Coolidge Corner Theatre, Bill began working with Wayne Wadhams at The Film Associates in Boston. 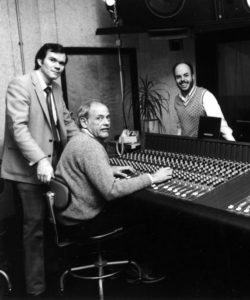 In the early 1980s, Berklee hired Wadhams to create the first purpose-built recording studios at Berklee, as the college was launching the Music Production and Engineering Department. Bill designed and supervised the installation of nearly all the studio wiring and equipment. I know I speak for our entire community in expressing our condolences to Bill’s loved ones, friends, colleagues, and former students. I invite you to share your stories and memories below. I learned so much from Bill Gitt, even though I was never in one of his classes. His corrective guidance when I was a student and assistant supervisor and when I was learning to use the (then cutting edge) BTX and Sony digital gear taught me a great deal about professionalism, persistence, and the importance of doing things right (preferably the first time). In my later career moves in the Coast Guard, Law Enforcement, and Information Technology, Bill’s examples stuck with me, and I credit him for his contributions to my success.